The combination of saxophone and harp is as beautiful as it is unlikely. 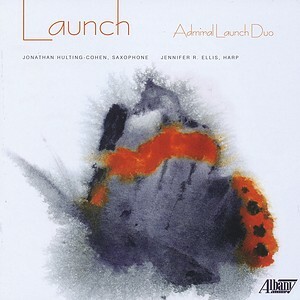 When saxophonist Jonathan Hulting-Cohen and harpist Jennifer R. Ellis - collectively known as Admiral Launch Duo - first played together, they were captivated by the lovely timbres produced by these two exceptionally expressive instruments, and intrigued by the vast range of sounds they could create together. On December 1, 2018, Admiral Launch Duo releases its debut album, Launch, on Albany Records (TROY1752). The recording features the world premiere recordings of works by Natalie Moller, Patrick O'Malley, Christine Delphine Hedden, Stephen Rush, Angélica Negrón and Jasper Sussman, most of which were commissioned by the Duo. This recording also includes two transcriptions: Ida Gotkovsky's Eolienne, originally written for flute and harp, was arranged for saxophone by the composer. Marcel Tournier's La Lettre du Jardinier was originally composed for voice and harp in 1912, and Jonathan Hulting-Cohen and Jennifer Ellis perform the arrangement they created for themselves. Named for the admiral butterfly and launched at the Fresh Inc Festival in 2013, Admiral Launch Duo has since appeared at venues coast-to-coast, from San Francisco's Center for New Music to Spectrum NYC. Saxophonist Jonathan Hulting-Cohen is co-founder of The Moanin' Frogs and assistant professor at the University of Massachusetts Amherst. Harpist Jennifer R. Ellis has premiered over 80 works and has served as the first-ever harpist with OneBeat, Bang on a Can Summer Music Festival, and Splice Institute. Reflecting on the unusual instrumental combination, Jennifer Ellis says "the timbres blend beautifully. It's one of those things that sounds crazy until you actually try it, and then you think, 'Why haven't I done this before?'" Admiral Launch Duo's debut recording, Launch (TROY1752), is available online and in stores beginning December 1, 2018.